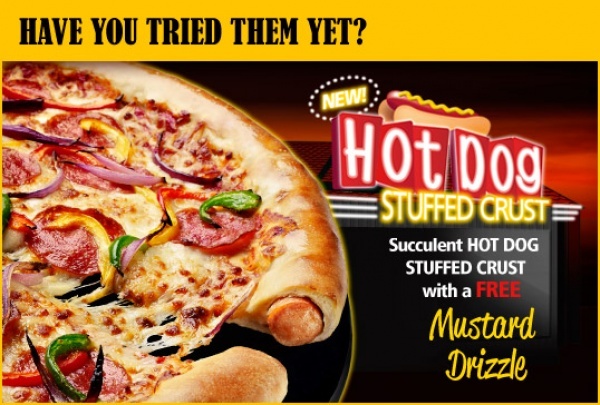 There cer­tain­ly might be more impor­tant things to blog about, but noth­ing at the moment seems quite as sat­is­fy­ing as the “Hot Dog Stuffed Piz­za” on offer to the cit­i­zens of the UK. I think the pic­ture says it all. Maybe this would be bet­ter if instead of hot dogs, we had cheese dogs (hot dogs or sausages stuffed with cheese). Maybe we should invent a “Bacon Stuffed Piz­za” … ? Make a ring out of a weave of bacon? I dun­no. 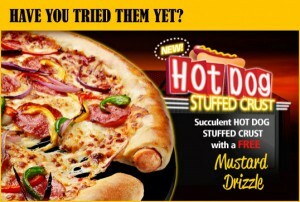 Maybe “Cheese Bacon Dog Stuffed Piz­zas” … ? This entry was posted in Products and tagged bacon stuffed pizza, fast food, hot dog, hot dog stuffed pizza, pizza, product. Bookmark the permalink. Heard on CBC radio this after­noon that Piz­za Hut also offers these kin­da piz­zas — inter­view­er and -ee both thought they’d be dis­gust­ing. Bad Behavior has blocked 271 access attempts in the last 7 days.